Ever since I did the White Men Can't Jump cards I've been dying to use the 1992-93 Skybox inspired theme again. I finally came across a picture that I thought would would great in that style. It's needed to be an image with a basketball so you can do the whole Skybox glowing trail thing. This image of Arnold looks to be a a Planet Hollywood event of some sort. Otherwise I have no context. Not that that matters a great deal. 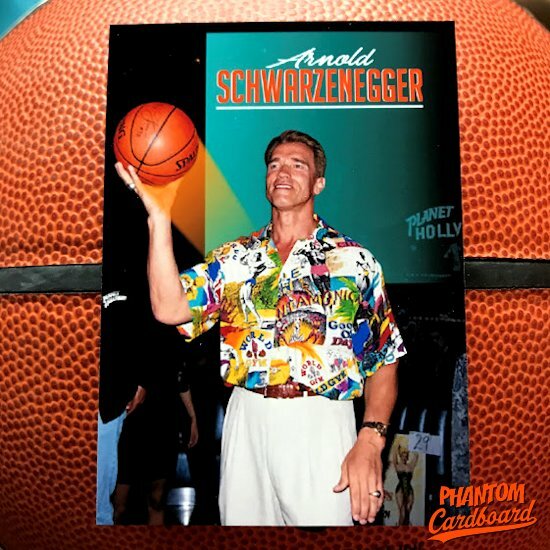 It freakin' Schwarzenegger in a loud shirt holding a basketball. That's enough for me.